NFC makes living in a multi-device world more enjoyable. With just a tap, new purchases can perform service discovery, connect to the home network, or pair with other components, such as a big-screen TV or high-end speakers. As a companion technology to Bluetooth, ZigBee and WiFi, NFC makes it easier to log on, commission devices, and use predetermined settings. Tap your smartphone to a Bluetooth speaker or headset, and the two devices securely pair automatically — you don’t have to type a code or search for a connection. Peer-to-Peer Mode is used to establish a two-way communication channel between a pair of NFC- enabled devices. 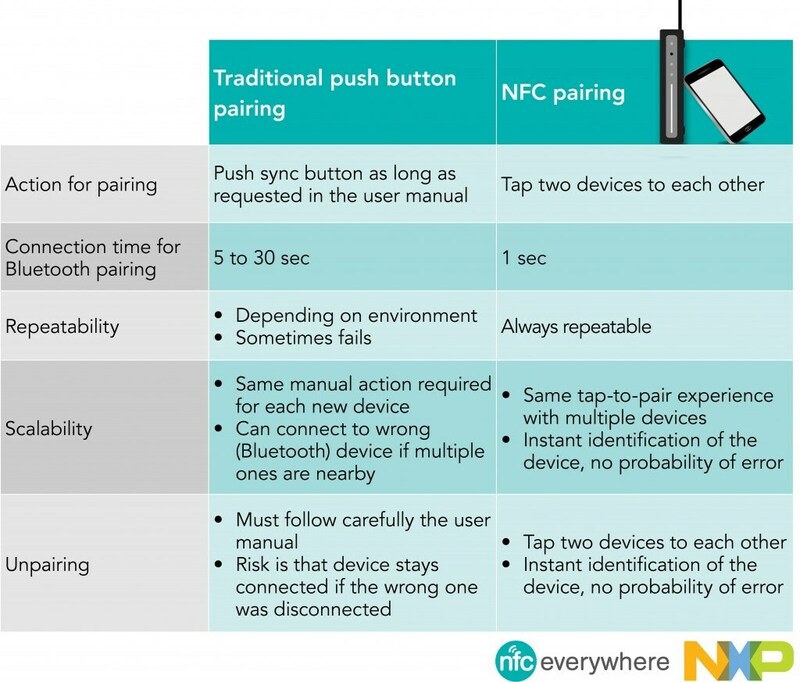 Each NFC-enabled device serves as an endpoint, meaning the two systems can initiate a communication as equals, or peers. The two-way nature of Peer-to-Peer Mode enables more sophisticated interactions between devices, so you can, for example, pair with Bluetooth or WiFi, or exchange business cards with a colleague. Peer-to-Peer Mode can use a passive communication scheme. Only one device needs to be active, drawing power to generate the necessary RF field. The second device can remain passive, acting only as a target and modulating the field. Working in passive mode is a significant benefit, from the standpoint of power consumption. If you like what NFC is doing for smartphones, you’ll want to check out the latest smart TVs and set-top boxes – like this one from French operator SFR. 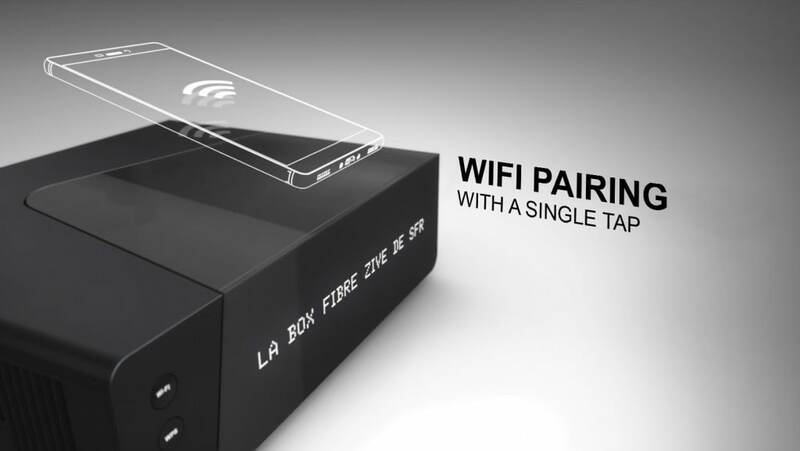 It’s a small, powerful all-in-one premium set-top box, and the first available on the market to be equipped with NFC. Simply tap your NFC-enabled phone, tablet or camera to the set-top box to establish a wireless connection and you will be able to enjoy videos and pictures on a big TV screen. Add another pair of speakers to the TV — also with a single tap of the speaker to the box — and you will almost have a cinema-like movie experience in your living room. Bringing this experience to the next level, even a multi-speaker audio system can be set up with NFC. If all speakers are equipped with an NFC chip, you simply tap one speaker to another to establish the connection. That’s what we call a true wireless stereo system — and it works with any phone, no matter if it is NFC-enabled. NXP’s NFC controller PN7120, comes with embedded firmware, which makes it the perfect choice for all applications running in Android, Windows, Linux or any other OS environment, as they are often used in devices like set-top boxes. NXP’s NFC tag portfolio (NTAG series) is particularly well suited for use with battery-powered systems, such as speakers and headsets, where it can wake the system and initiate Bluetooth or WiFi pairing. What will be the first NFC device in your living room?